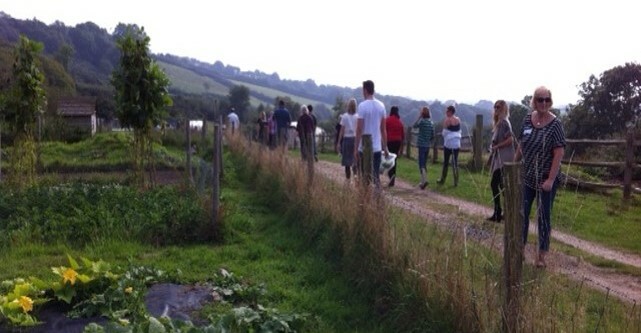 We pulled our wellies on and headed down to Park Farm near Axminster, home to River Cottage HQ in Devon, to spend the day getting a taste of how the folks at River Cottage are inspiring people to explore the journey of our food from field to fork. 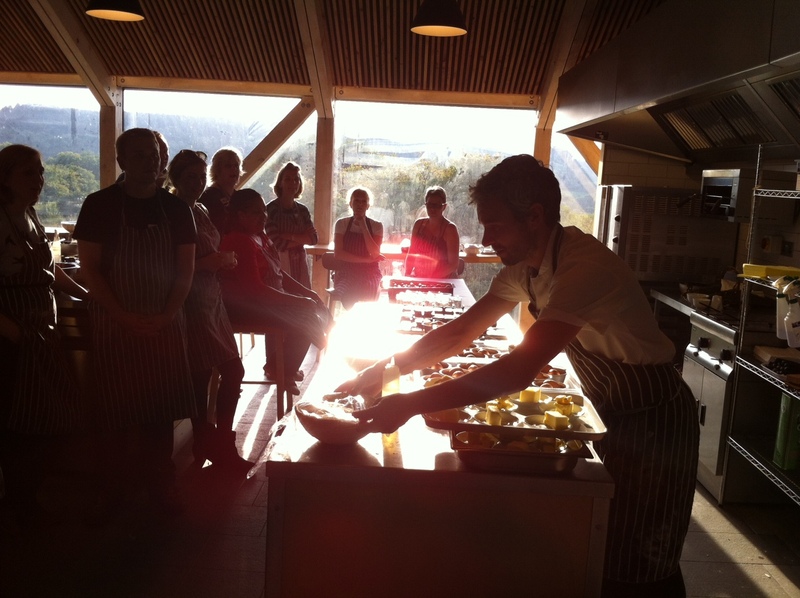 We joined guests on the River Cottage Experience course, created to connect people to home-grown, home-cooked food and inspire people to get the best out of seasonal and ethical produce by cooking from scratch. The day started with an introduction to bread, setting the scene with a reminder that a true loaf should only contain 5 basic ingredients: yeast, water, salt, flour and sugar. We couldn’t agree more. 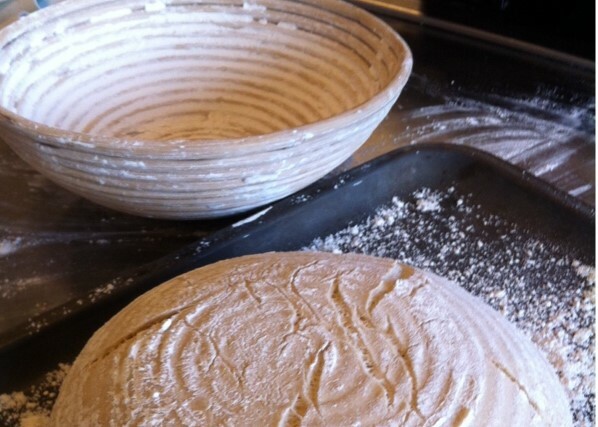 Head Chef, Gelf, got the class mixing and kneading dough for a simple white loaf which we left to prove whilst heading out around the farm to see the livestock and crops based on the farm. 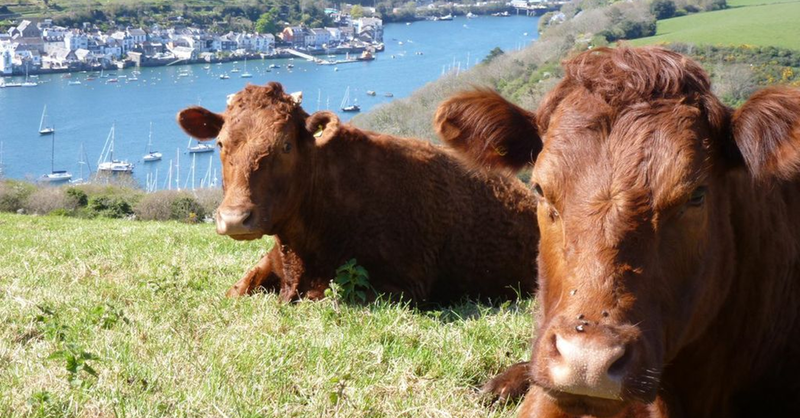 Set in 65 acres of rolling Devon hills, the pebbly soil and steep gradient of the land surrounding Park Farm lends itself best to livestock and grazing. The flatter parts of the terrain is put to good use: unheated polytunnels and allotment areas dedicated to cultivating fruit and veg, and carefully managed traditional hay meadows designed to provide feed for livestock and act as a biodiversity haven for bugs, bees and butterflies. 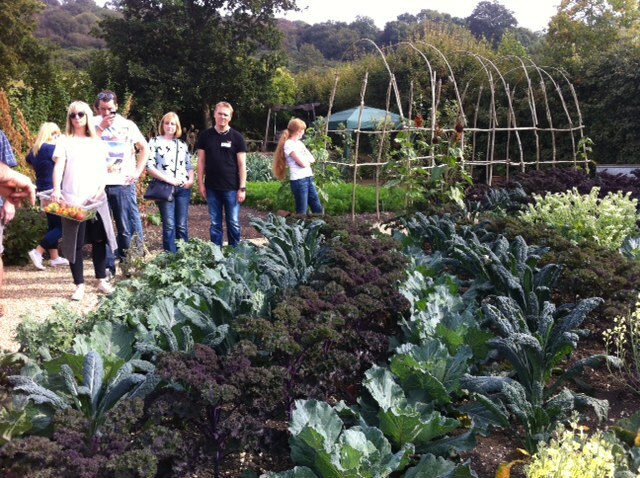 Hugh’s famous kitchen garden was brimming with autumnal seasonal veg – cavolo nero, curly kale, runner beans, broccoli and more. Destined for the River Cottage kitchen, roots, brassicas, legumes and salad crops grow up set against the backdrop of the famous River Cottage farmhouse. The crop types are rotated around four quadrants of the garden each year to minimise crop-specific pests and diseases and nutrients. 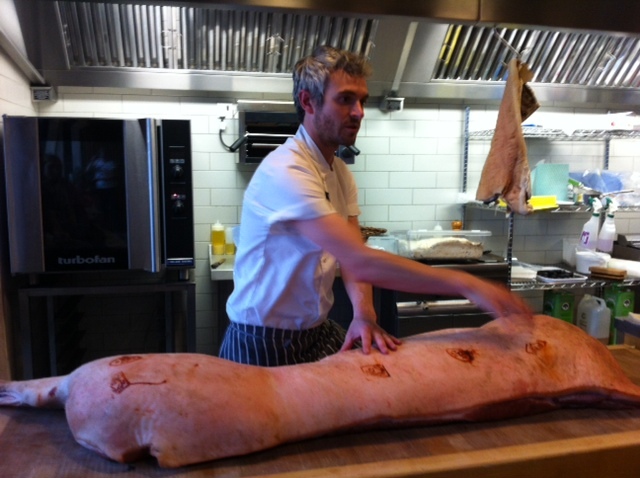 The team at River Cottage rear their own livestock – cattle, sheep, poultry and pigs. All are cared for to the highest possible organic welfare standards and kept within a stone’s throw of the kitchen – the food chain doesn’t get much shorter than this. Back to the kitchen …. Staying true to the season, we started prep on an autumnal game casserole pie that we would be tucking into together later on that day. An earthy mix of meat including hare (net caught), wood pigeon, duck, grouse and beef reared on the farm and hung for 6 weeks, the flavours rising in the River Cottage kitchen had everyone sneaking an extra mouthful to ‘check the flavour’ just one more time (!). 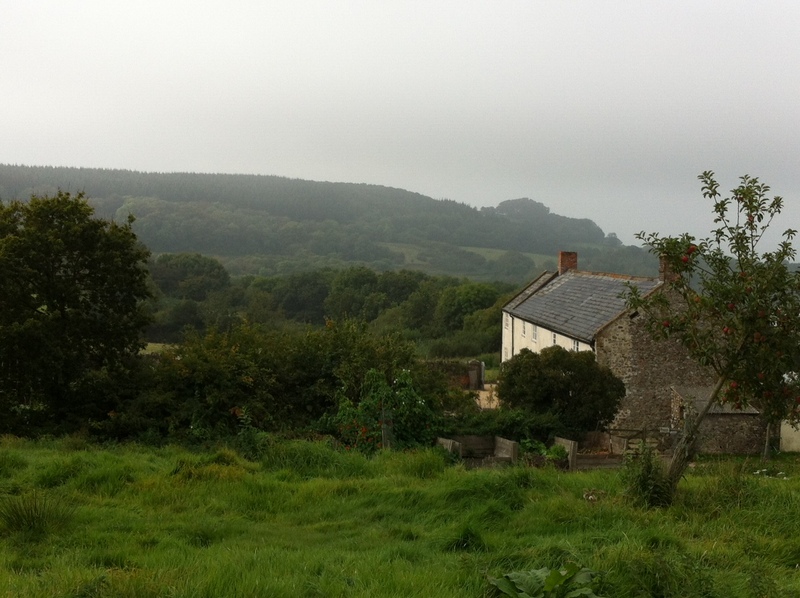 We left the casserole to reduce while we headed outside to make our own pizza for lunch in River Cottage’s outdoor wood-fired oven and soak up the breath-taking Devon views. In a scene similar to a Bake Off, it was back to the kitchen to make up a block of rough puff pastry, carefully creating layers of butter and flour which we used to top off our casseroles. Simpler than some might think, we cracked straight on to whipping up a batch of profiteroles which were popped into the oven, then it was time to learn about butchery and home-curing bacon techniques using a pig reared by the River Cottage team at Park Farm. How often do you see pigs in a field? Did you know that we rear as many pigs in the UK as sheep? How many pigs have you seen in a field in the countryside? Next time you pick up a cheap packet of sausages in a supermarket, spare a thought for the pigs. You see plenty of sheep grazing in the fresh air, but the majority of our pigs spend their lives reared indoors in enormous barns, fed only feed and pumped with antibiotics to meet low prices demanded by consumers. You can choose to support high-welfare farms and happier pigs who have had the chance to snuffle around for tasty morsels in the outdoors. After a great day on the River Cottage Experience course seeing how food gets from the farm to our plate, the end of the day marked a time to sit down with a glass of wine, discuss what was learnt and enjoy the fruits of our labour … with a dash of River Cottage sparkle added to the food by their team of chefs. All in all, everyone enjoyed what was a fulfilling, fact-laden day – taking home a feeling of being better connected with where our food comes from and a bag full of bread, profiteroles and casserole! If you’d like to join the River Cottage team for a day on the farm cooking, eating and drinking (or think it’d make a great Christmas present), you can see the full range of courses here. Occasionally, for whatever reason and in whatever way, we all feel the need to get back to our roots. Genealogists can spend hours on the internet. For organic food lovers, venison is the way to go. It’s about as natural and unadulterated as meat gets. Truly wild animals can’t, by definition, be organic, but farmed venison, whose breeding and life cycle has hardly changed in the last thousand years, can. In fact, without the likes of Bad King John and James I and their bloodthirsty chums chasing them, a deer’s life is on the up. These days they’re born in the spring, live a stress free ‘park life’ and are dispatched in the field, eighteen months later, by expert marksmen, before the stress of autumn rutting. Across the pond, venison is all the rage with followers of the Weston A Price Foundation, but you don’t have to be an earth mother to enjoy it. The season for farmed venison actually starts in August, but despite it shining on the barbecue, it’s much more suited to autumn eating. Why we don’t eat more of it is a mystery, because on health, welfare and sustainability grounds it can’t be beat. It’s taken a generation for venison to divest itself of its toff nosh/cute bambi/’no I deer’ jokes image. It’s been a tough nut to crack, but finally the health benefits (high in protein, iron and Omega-3, low in fat and cholesterol), availability and our endless quest for something new has won it its rightful place on our plate. When I think of venison, I see comforting casseroles and chunky red wines, but it doesn’t have to be like that. Firstly, it’s just like any meat: some cuts grill, some roast, others stew. Secondly, venison is worldwide and totally adaptable – it takes rogan josh and stir fries in its stride. It also lends itself beautifully to my current favourite ‘dish of the day’, Bo Kho/Vietnamese Beef Stew. My top tip is, in a casserole, once you’ve browned your meat and added the liquid, don’t even think about letting it boil. Slow cookers/crock pots are best but, failing that, the oven on minimum setting is your best bet. Lean meat always needs TLC. To keep the venison company, we’ve got some exciting new wines coming your way in October. Nativa Cabernet Sauvignon will work with roasts and steaks and Nativa Carmenere is perfect with casseroles and stews. There will also be a rustic Rosso Piceno for ragus and an award winning Corbières, so watch this space for our new Autumn wines. The cow jumped over the moon, and organic beef prices are going in the same direction. Horse-gate has been good news for food businesses whose core values centre on known and proven provenance. Organic certification is by far the clearest way of demonstrating this, but the problem now is that everyone is trying to muscle in on the act. Supermarkets, who for years have paid little more than lip service to organics, treating it more like a loss-making inconvenience they could do without, are all reportedly desperate to re-list as much organic produce as possible – particularly beef. However there just isn’t enough to go around. Last year’s poor harvest and growing conditions has meant that even low input, extensive organic farmers haven’t had enough fodder (grass, silage and hay) so they’ve turned them out to wait for the sun to shine and the organic spring grass to grow and give them a rich enough diet. Poor supply is compounded by the fact that until recently, premiums for organic beef have been minuscule (as low as 5%) and many farmers have decided that the challenge of producing their herds as fully organic has been too great, so have surrendered their organic certification as a result. If the supermarkets had supported organic farmers over the last five years, rather than giving them the cold shoulder, supply wouldn’t be so tight now. Now the premium has risen to a stonking 30% with no signs of levelling off. Rearing organic beef, even on grass, does cost more money, but not that much. Most farmers would be happy with 12-15%, which I would hope you would be happy to pay. It seems like a small price to pay for the peace of mind guaranteed provenance brings and the good work organic farmers do looking after our green and pleasant land. At Riverford we have a good relationship with our suppliers. We pay a fixed price based on an average of the last quarter and this has worked well. Obviously they want to make an honest buck, but our farmers would much rather deal with us than buyers for the multiples. Most of them have been around for long enough to have experienced first hand the fickle whims of ‘those who must be obeyed.’ They didn’t start farming, and convert to organic, to see the fruits of their labour disappear into an anonymous black hole to be blended with 25% horse meat. However, no farmer will go on selling beef for significantly less than market price for long, so we’ve shortened the last quarter by a month to hurry up the process of bringing our prices into line, so we can still pay a competitive price for our suppliers’ organic beef. I’m afraid the inevitable outcome will be a small rise in our prices for all things beefy, but rest assured, we will keep increases to a minimum. We want to work with, and support our farmers as much as we want to deliver the best priced, best quality food via the shortest supply chain. That’s the Riverford way. It’s been a tough start to the year for the conventional meat industry – ‘horsegate’, closely followed by more research showing that a diet heavy on processed meat products isn’t a good option. Two seemingly separate issues, in practice closely connected. Now that we have had a month or two to reflect, and the emotional outrage has dissipated, we are left with a murky picture of duplicity and dodgy dealings. The food ingredients industry is partly made of unaccountable, offshore, often privately-owned trading companies with tentacles extending all over the world. Containers of frozen and chilled product crisscross Europe, and the world, controlled from an anonymous computer in a hidden away office – these people don’t want a high profile. Given that this is the world we live in, and governing international traders in offshore locations is nigh on impossible, you could argue that we all got off lightly – this time. It’s made the multiple retailers shout about provenance and buying British, but in practice that won’t extend beyond meat cuts on the shelves. They can set up supply chain audits to their hearts’ content but when the main driving force is price and the quest for cheap food, what are they worth? They might get the right species but that still leaves plenty of scope for abuse. Drugs and antibiotics, concealed fat, mechanically recovered and tenderised meat, animal welfare etc aren’t going to show up in a DNA test. And don’t get all NIMBY and say it’s only our continental cousins who are to blame. Question: Where does all this dodgy meat end up? Answer: In processed meat products. Hence,including both in this blog. Question: Is food processing and technology for the benefit of the industry or the customer? Answer:We might convince ourselves that it’s making our lives easier and bringing us food that we can’t make at home, but the main driver is adding value, extending shelf life and making money – so the answer for ten is industry. The contents of a factory made sausage or pâté bear no resemblance to what you might make at home. Obviously we don’t make turkey twizzlers and the like, but I wouldn’t want to. I can’t believe that I would be writing this if all processed meat products were made with a view from the customer perspective rather than that of the food industry. At Riverford, and in much of the organic world, things are different. Food technology does have its place in organic food but, thanks to the Soil Association, it is mainly for the benefit of the consumer. The list of ingredients in our sausages, burgers and bacon is short. You can fit them and product costings on the back of an envelope, which was about as close to a business plan as I got. As one of our butchers said – ‘with our burgers the mincer is only saving work for our teeth’. Now that is the ultimate example of food processing for the customer’s benefit – very much the Riverford way. Lamb is to Easter what turkey is to Christmas but why? Despite being a relatively recent import from the Americas, at least Christmas turkey marks the culmination of a natural ‘season fitting’ yearly cycle. Paschal, Passover, ‘lamb of god’ significance is something of an anachronism and doesn’t really fit in with farming reality. However there’s nothing wrong with a bit of pagan ritual to remind us of our past – especially when it tastes so good. Most flocks of ewes naturally lamb in late winter/spring and take four months plus to grow, meaning that eating new season lamb at Easter definitely doesn’t fit into any rationally conceived farming calendar – even less so this year with Easter in March. 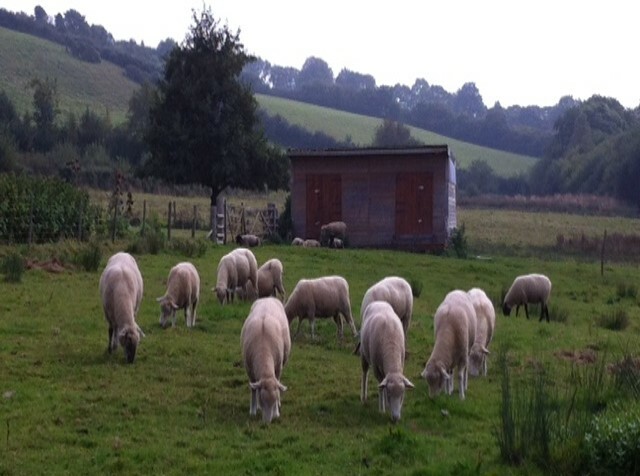 However, like sheep, farmers are an adaptable breed and if you want to eat lamb at the time they would normally be born, then lamb you shall have – albeit outside of the natural lambing cycle. Officially, a lamb becomes a sheep when it grows four teeth (after about a year). With culinary trends happily favouring slightly older, more flavoursome lamb (approx. 9 months – 1 year old), many of our farmers are able to lamb later, in mid-summer, for the Easter market. This means a lamb which is a little older, but season fitting. Carefully managed, separating slow-growing triplets from faster-growing singleton and twin lambs, means many of these older lambs are at their prime now. Our Easter lambs are all Devonian, born and bred from Peter Howlett at Moorhuish Farm, Brixham, David Camp near Totnes and Nigel Eggins on the River Tamar. All are three of our top farmers that we have worked with ever since we started offering meatboxes at Riverford. The Camps are an old Devon farming family with fathers, uncles and cousins all over the place – their lambs grow just over the hill from Riverford in Totnes, and on a big strip of National Trust land overlooking Hope Cove on the coast. Born in late spring/summer last year and raised traditionally, our lamb may be a little older than the 4-month old slightly forced, mainly indoor reared, ‘sucked lamb’ available. This makes for a happier, healthier lamb that is older but much, much tastier. Chefs love their milky, sucked lambs as a vehicle for their sauces but, for a roast, older is definitely better. 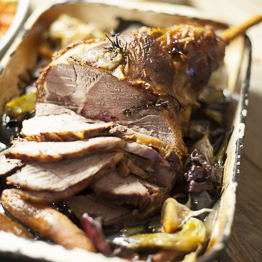 The classic roast lamb with rosemary and garlic: Takes a lot of beating but for flavour and easy cooking, slow roasted shoulder is equally good – particularly when the lamb can share the oven with a dish of potato dauphinoise or gratin while you relax or build up an appetite. If there is just the two of you, or you really want to push the boat, out try a rack or two. For guaranteed foodie brownie points rack of lamb can’t be beaten – half an hour in the oven, sliced into cutlets and artfully arranged and we’re all queuing up for Masterchef. Given the seasonal scarcity of fresh greens, a flageolet bean cassoulet with a few carrots mixed in is the ideal Easter accompaniment for roast lamb. Again it can be done in advance so Easter lunch can be as easy as you want to make it. Just leave room for a chocolate egg or two. Family herds, parkland ruts and the food of kings. As the damp autumn winds pick up and leaves start a-whirling outside, the lure of warming casseroles, cosy fires and spicy red wine become all the more tantalising. However, right now you’ll be missing a trick if you reach for the diced beef or cubed lamb; autumn means venison season, and all the rich, deep flavours that come with it. In the past, the type of venison sold was often from more mature wild deer, whose feral existence and diet of heather and bark did little to make the meat palatable to today’s tastes. A common misconception that has come out of wild venison’s tougher nature is that people often think they need to marinade the meat to make it tender enough to eat. cooking it is really important, to make it as juicy as possible). It’s lower in fat than a skinned breast of chicken, higher in iron than any other red meat and low in cholesterol. It’s also brimming with Omega-3s, which have an absurdly long list of health benefits of their own. If you’ve been put off by the overpoweringly gamey flavour of old fashioned venison, give ours a whirl. It’s more like a really flavourful beefy taste that even kids will get stuck into.